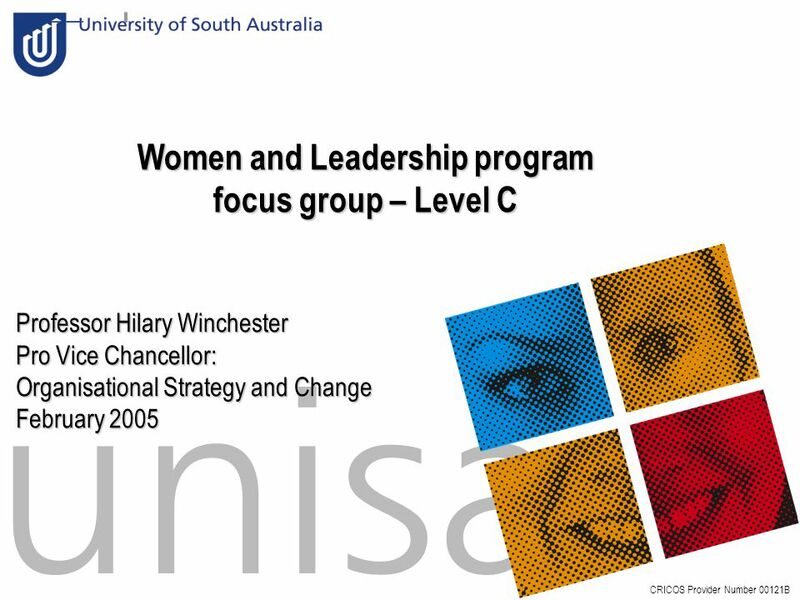 Slide:1 Women and Leadership program focus group – Level C CRICOS Provider Number 00121B Professor Hilary Winchester Pro Vice Chancellor: Organisational. 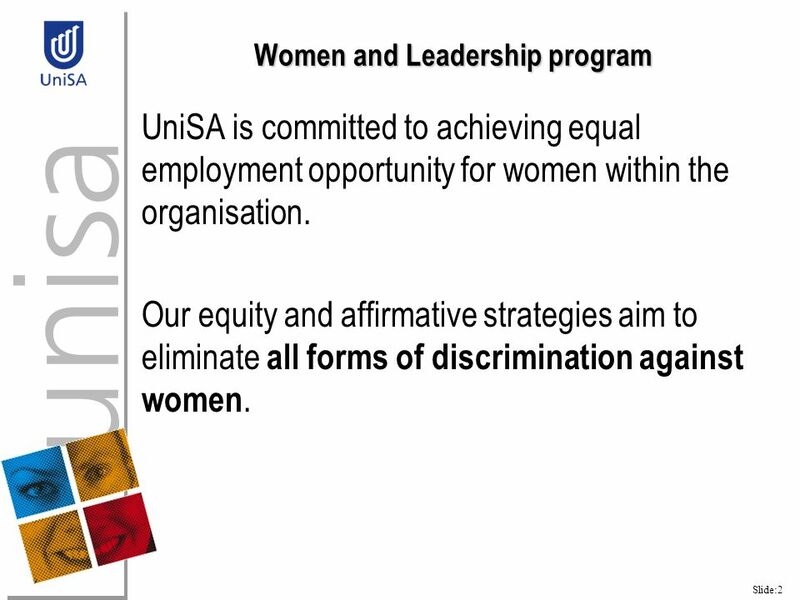 2 Slide:2 Women and Leadership program UniSA is committed to achieving equal employment opportunity for women within the organisation. Our equity and affirmative strategies aim to eliminate all forms of discrimination against women. 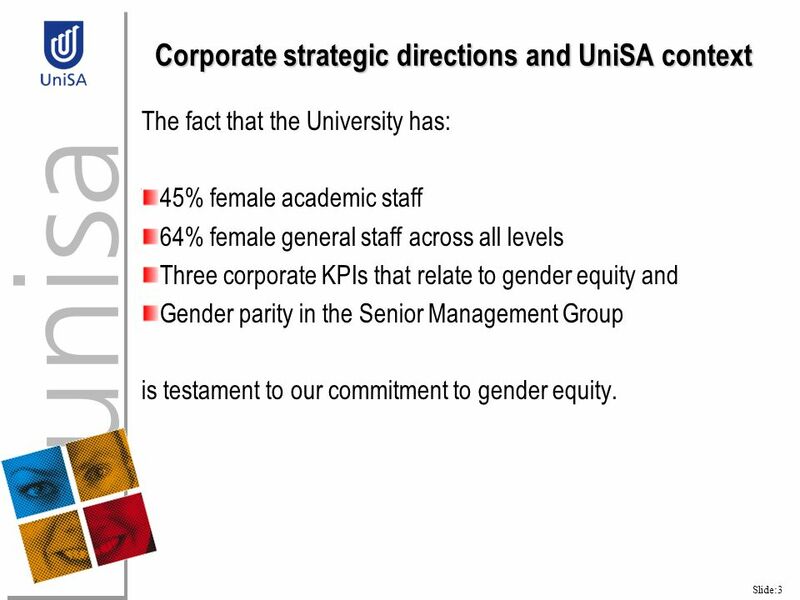 3 Slide:3 Corporate strategic directions and UniSA context The fact that the University has: 45% female academic staff 64% female general staff across all levels Three corporate KPIs that relate to gender equity and Gender parity in the Senior Management Group is testament to our commitment to gender equity. 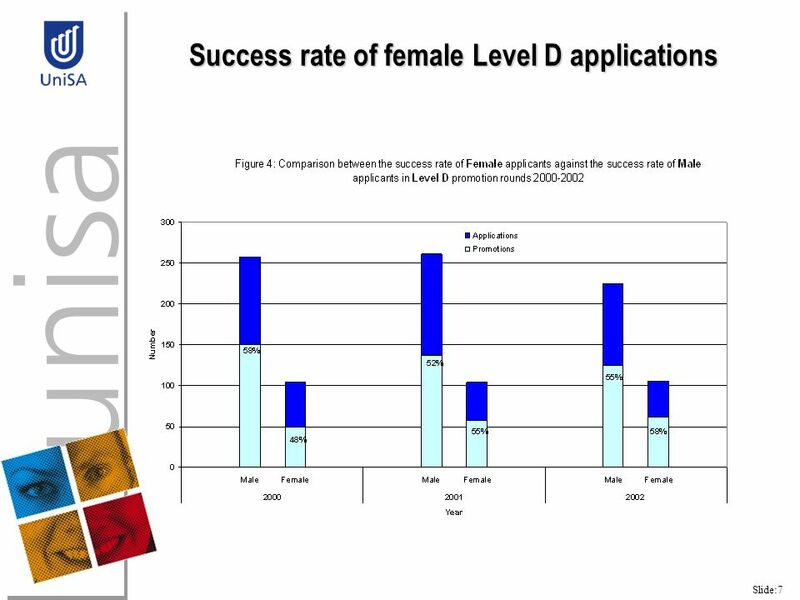 4 Slide:4 Senior women The proportion of women decreases at senior levels. 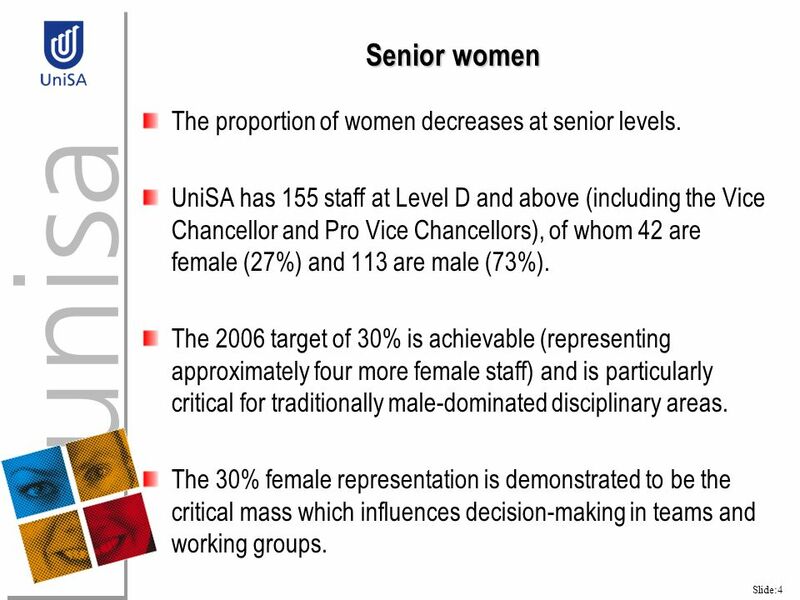 UniSA has 155 staff at Level D and above (including the Vice Chancellor and Pro Vice Chancellors), of whom 42 are female (27%) and 113 are male (73%). 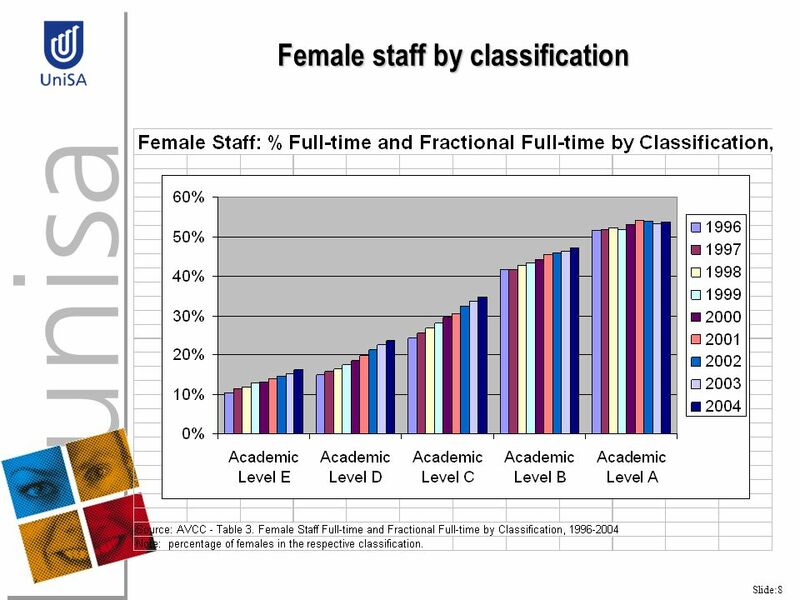 The 2006 target of 30% is achievable (representing approximately four more female staff) and is particularly critical for traditionally male-dominated disciplinary areas. The 30% female representation is demonstrated to be the critical mass which influences decision-making in teams and working groups. 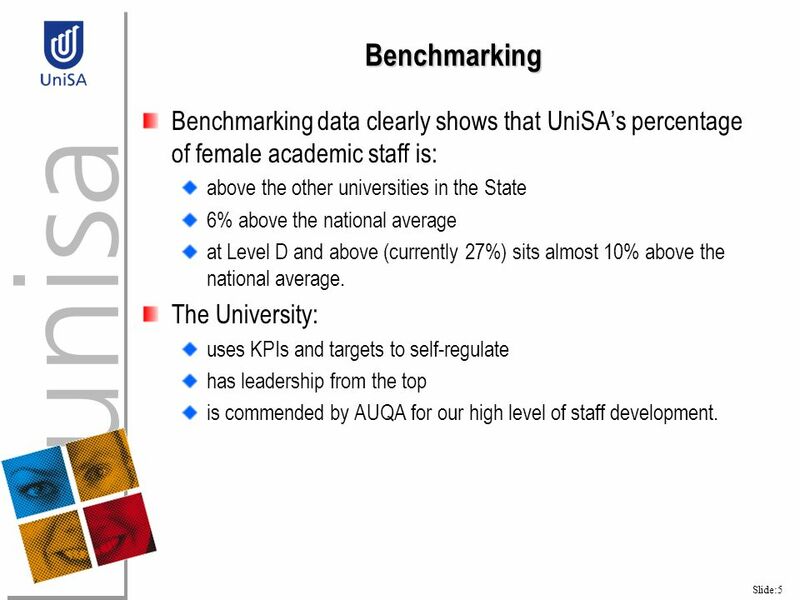 5 Slide:5 Benchmarking Benchmarking data clearly shows that UniSA’s percentage of female academic staff is: above the other universities in the State 6% above the national average at Level D and above (currently 27%) sits almost 10% above the national average. The University: uses KPIs and targets to self-regulate has leadership from the top is commended by AUQA for our high level of staff development. 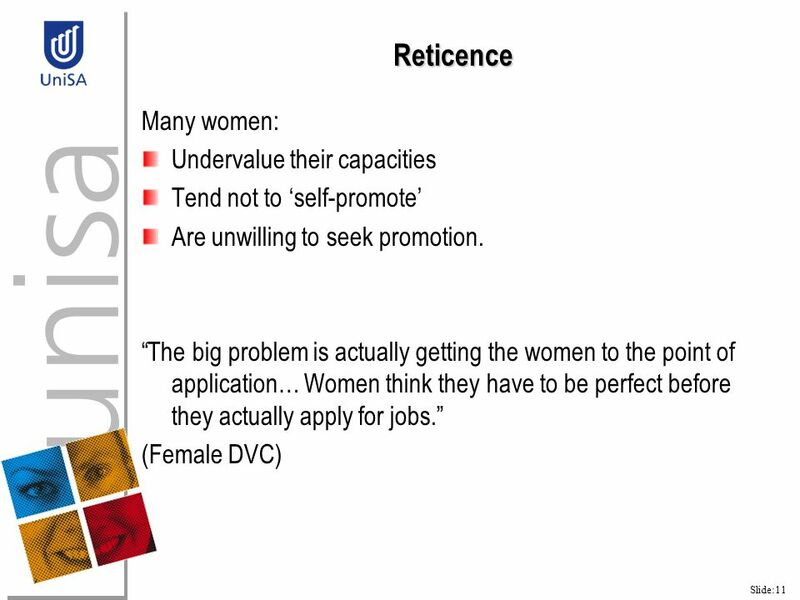 6 Slide:6 Barriers to Promotion for Academic Women Staff A research team is investigating barriers to promotion for academic women staff. Funded by the AVCC and the Colloquium of Senior Women, the team comprises myself, Shard Lorenzo and Lyn Browning from the HR Unit, and Dr Colleen Chesterman, Director of ATN WEXDEV. 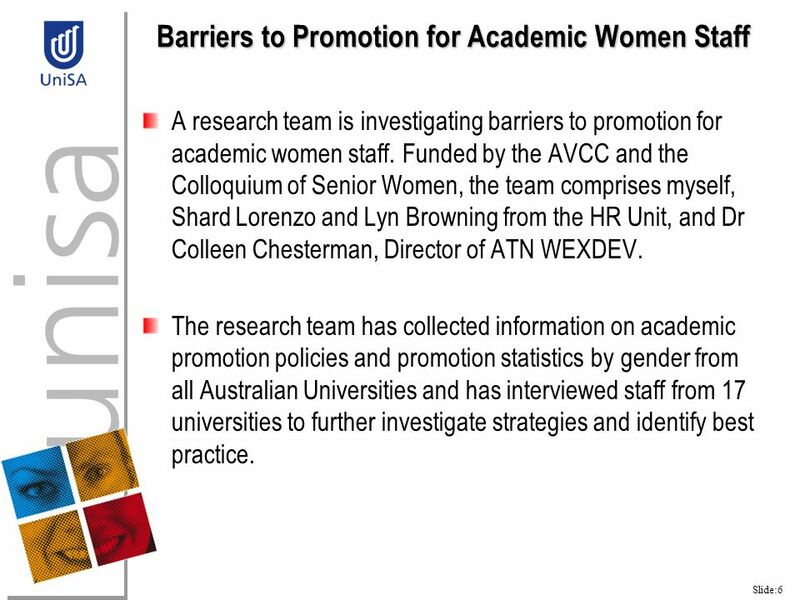 The research team has collected information on academic promotion policies and promotion statistics by gender from all Australian Universities and has interviewed staff from 17 universities to further investigate strategies and identify best practice. 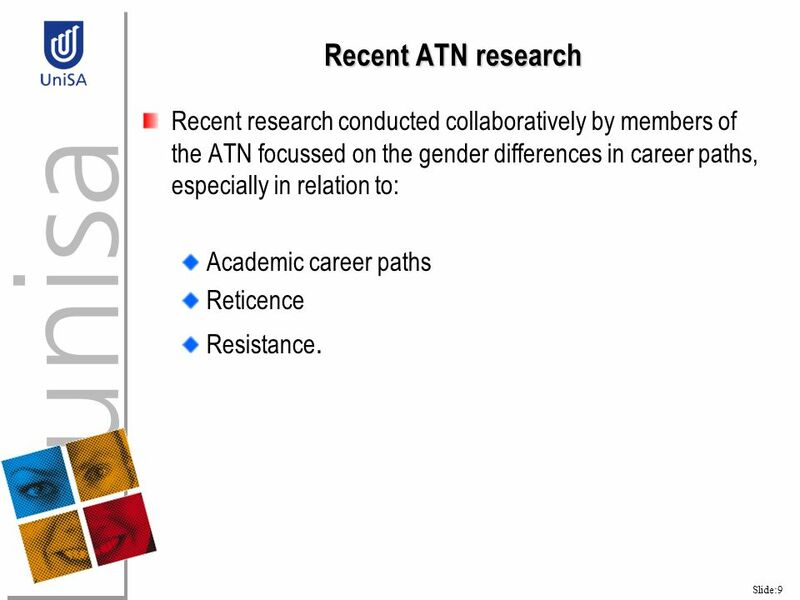 9 Slide:9 Recent ATN research Recent research conducted collaboratively by members of the ATN focussed on the gender differences in career paths, especially in relation to: Academic career paths Reticence Resistance. 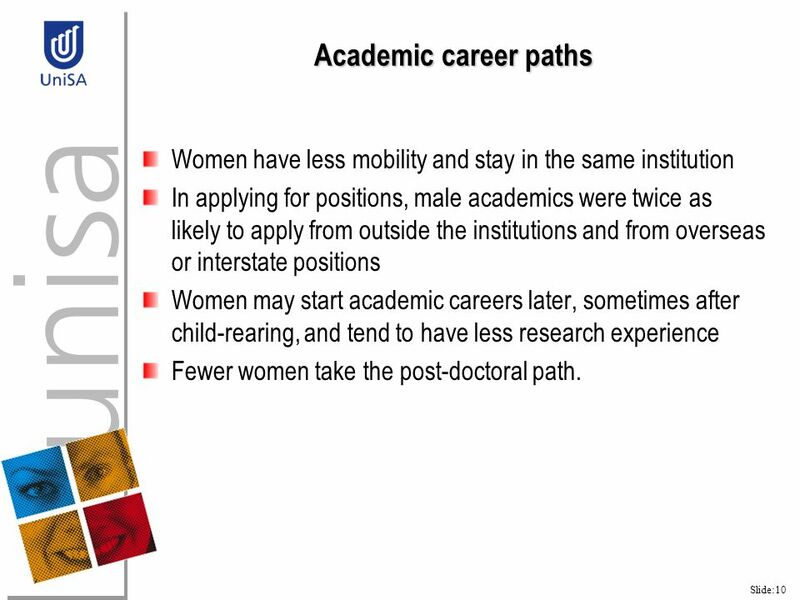 10 Slide:10 Academic career paths Women have less mobility and stay in the same institution In applying for positions, male academics were twice as likely to apply from outside the institutions and from overseas or interstate positions Women may start academic careers later, sometimes after child-rearing, and tend to have less research experience Fewer women take the post-doctoral path. 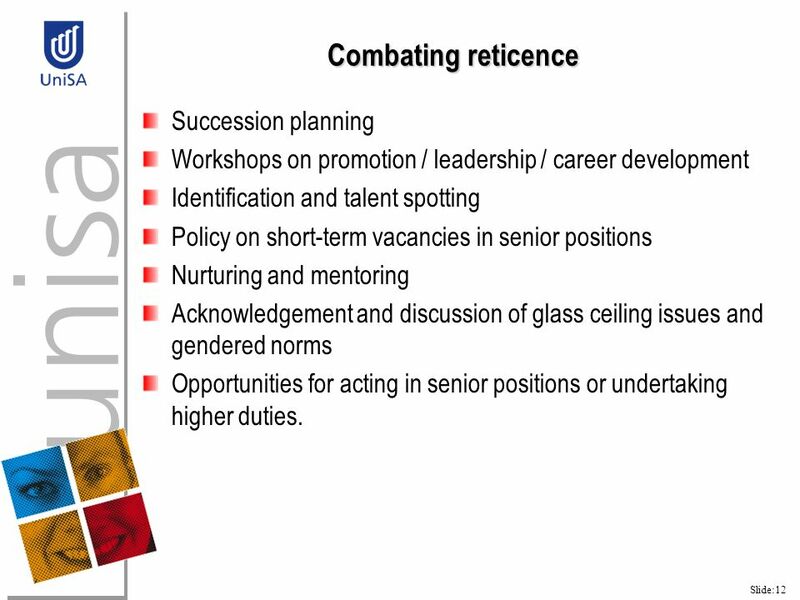 12 Slide:12 Combating reticence Succession planning Workshops on promotion / leadership / career development Identification and talent spotting Policy on short-term vacancies in senior positions Nurturing and mentoring Acknowledgement and discussion of glass ceiling issues and gendered norms Opportunities for acting in senior positions or undertaking higher duties. 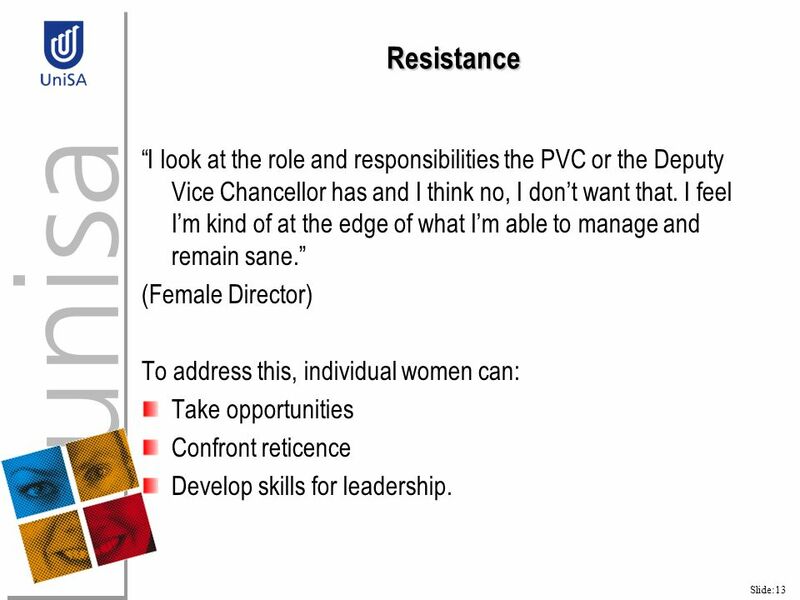 13 Slide:13 Resistance “I look at the role and responsibilities the PVC or the Deputy Vice Chancellor has and I think no, I don’t want that. I feel I’m kind of at the edge of what I’m able to manage and remain sane.” (Female Director) To address this, individual women can: Take opportunities Confront reticence Develop skills for leadership. 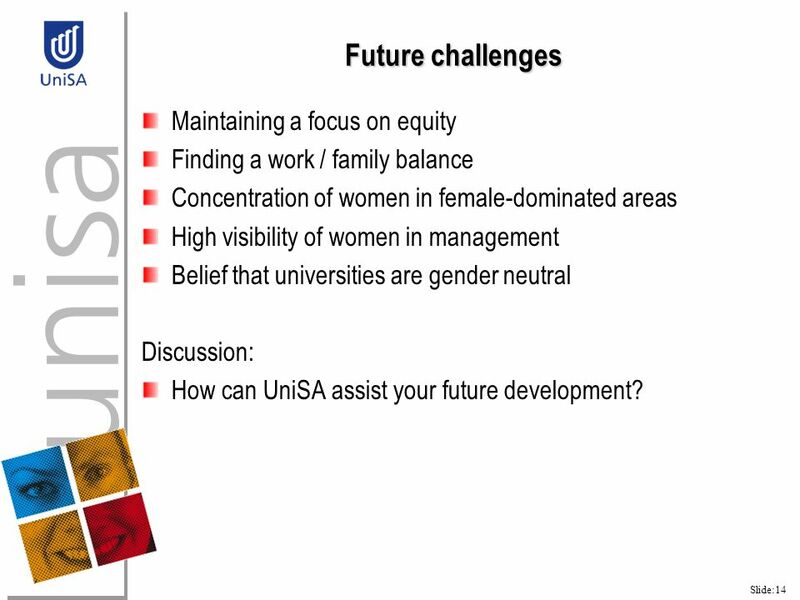 14 Slide:14 Future challenges Maintaining a focus on equity Finding a work / family balance Concentration of women in female-dominated areas High visibility of women in management Belief that universities are gender neutral Discussion: How can UniSA assist your future development? Download ppt "Slide:1 Women and Leadership program focus group – Level C CRICOS Provider Number 00121B Professor Hilary Winchester Pro Vice Chancellor: Organisational." A new strategy to promote women in sport through the United Nations Johanna Adriaanse Chair International Working Group on Women and Sport University of. Presented by Ajit Mehat Director General NATIONAL LABOUR OPERATIONS DIRECTORATE LABOUR PROGRAM HUMAN RESOURCES AND SOCIAL DEVELOPMENT CANADA Challenges. Encouraging Women into Engineering Research in Europe. Gender Inequalities – The Big Picture Statistically speaking, girls get the best grades so they should get the best jobs. BUT women still earn only about. 1 Gender Pay Gap Quiz Welcome to the gender pay gap quiz! This short quiz uses multiple choice questions to explain the causes and impact of the gender. Regions for Economic Change: Innovating Through EU Regional Policy Workshop 2B Developing Poles of Excellence: Partnerships Between Research Institutions. The New University of Bath People Strategy for 2010/11 – 2013/14 Professor Glynis Breakwell, Vice-Chancellor Peter Eley, Deputy Director of HR. Managing the Statutory Requirements for Assessment April 2011. NIHR Delivering Better Health Through Training Researchers 19 September 2011 Dr David Cox Deputy Director – Research Faculty. Breaking through the glass ceiling Women in Management. 1 Employability of an Ageing Workforce Dr. Gerlinde Ziniel European Foundation for the Improvement of Living and Working Conditions. Academic Promotions Information Session Equal Opportunity Principles & Promotion Dr Maree Murray, Equity and Diversity Strategy Centre. University of Oxford People Strategy – April 2014. 1 PRESENTATION TO THE PORTFOLIO COMMITTEE ON PUBLIC SERVICE AND ADMINISTRATION Report on the causes and effects of mobility amongst senior management service. Administrative Staff and their Professional Development. Public Authority Equality Duties Paul McMahon Partner Partner. Slide No. 1 Forening af Erhvervskvinder 8/11/03 Women in Leadership - Get fact based Elin Schmidt Vice President Ethics & Social Responsibility Novo Nordisk.